Dungeon crawler games have become a staple of modern boardgaming. Brave, sweaty men, women, dwarfs and elves descending into the underground lair of an evil beast to find treasure and glory, there are new games that let you do that weekly. Most of these games tend to share some basics: monsters slaying, treasure finding and, especially lately, excellently detailed miniatures to play with. And, of course, the thing that keeps many players away from dungeon crawlers: dice. The genre tends to rely heavily on them, dice that you roll for movement, that you roll to attack, to cast spells, to defend. Everything you do, you roll dice. Now, I’m not generally opposed to dice, but when a streak of good or bad rolls can make or break the game for you, I have issues with that. What if someone took all the good things of the genre – monster hunting, treasures, heroes, miniatures – but left out that one problematic thing. A dungeon crawler without dice. Is it possible? 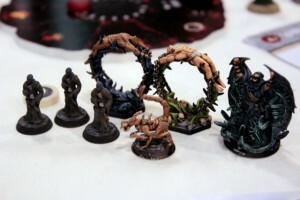 Designers Timo Multamäki, Thomas Klausner and Kevin Wilson seem to think so, and after we had the chance to spend some time with their coming Kickstarter project Perdition’s Mouth – Abyssal Rift since the Essen fair, we find ourselves agreeing. Many things in Perdition’s Mouth are, of course, similar to other dungeon crawlers. 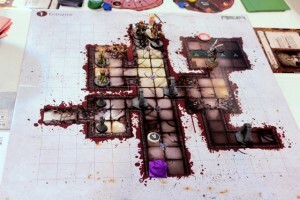 Each player still controls a hero descending into a dungeon to vanquish evil; in this case, evil comes in the form of a demon the deranged cultists are trying to awaken. Those heroes match the classic fantasy archetypes, you get your fighters, wizards, priests and so on. You move those heroes, as finely sculpted miniatures, over the grid of a dungeon floor, kill monsters, find treasures and fight your way downwards level by level until you either defeat the Demon or get eaten by giant insect monsters. But that’s where the similarities end. Looking at differences to most other dungeon crawlers, the most obvious is as mentioned above: There is not a single dice in sight. There is some randomness in the game, of course – a deterministic dungeon crawler would be both weird and boring – but the decks of cards used to provide that make sure that you don’t win or lose the game through an (un)lucky streak. The core mechanics of the game are more in line with modern euro-style games than with classic dungeon crawlers. 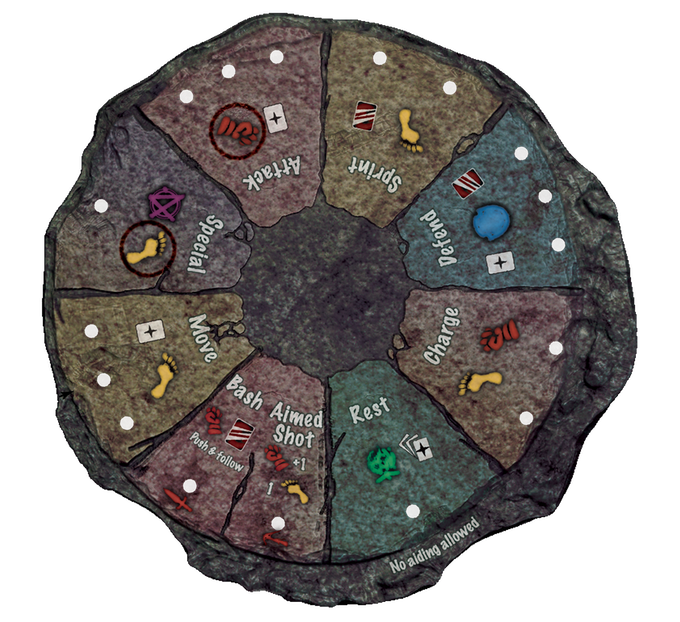 Central to everything is the Rock of Destiny, a rondel the players use to select their action for a round. The eight sections of the rondel show different actions – move, attack, defend,… – and players pick what to do by advancing their pawn on the Rock. There are two tricks to that. One is that each segment only has limited space. That’s mostly not a problem for moving or attacking with three spots each. If you want to move, you can find a way. But there’s only one spot on the Rest action that you have to pick sooner or later to get your cards back. The same goes for the Special segment that you need to activate your hero’s powerful special ability. To make the best use of those actions, you need good, tactical coordination with the other players. Even more so when you’re all stuck in a narrow corridor and you have to figure out who moves first on the Rock so your movement on the board makes sense. Coordination is key. The second trick with the Rock are the action points. Heroes have different amounts of action points per turn. Quicker characters like rogues get more of them, slow, plate wearing warriors get less, and for all of them the number goes down when they get wounded. Those action points need to be split cleverly: it costs one point to move by one segment on the Rock of Destiny, the points you have left after picking an action you use to actually take that action. For instance, with the four action points of a slower character you could move three steps on the Rock and get to a move action, but then you can only walk one step with your remaining action point. Or you could move only two step on the Rock and perform an attack, boosted with your remaining action point. But doing that instead of moving might mean that a weaker character ends his turn in the front line and gets bashed by monsters. You see, there are some hard decisions to be made. Helping with your options are your hero cards. Every character comes with his or her own deck of those. Most cards just show a number and one or more action icons. Those cards can be used to add action points when taking that action. Some cards instead show special abilities that can be anything from taunting enemies to attack you instead of someone else to a huge fire attack that burns everyone and everything in front of you.Oh, and don’t worry if you don’t have the cards you need right now, your allies can support you with theirs, but only when they are close enough. Those cards are powerful, but you don’t draw them regularly. To draw cards, you have to pick an action with the card draw symbol, to shuffle your discard pile and get it back you have to Rest. That adds hand management to the things you have to take care of. And there are even more things to consider when the monsters start moving. After all heroes had a turn, the game strikes back like you’d expect from a cooperative game. That phase may or may not get really nasty for the heroes. The monsters have their own rondel to pick actions on based on a card draw from the monster deck. The token on the monster rondel moves as many spaces as the number on the card and the monsters take ALL the actions the token passes. The cards in that deck have an average value of two, so most rounds will not be too bad, but every now and then you draw a five and get spawn new monsters, monsters move, monsters attack, spawn a different kind of new monsters and monsters attack again. Those turns are not fun, but since the number comes from a card deck you can be sure it won’t be fives all the time. The above explanation barely scratches the surface of Perdition’s Mouth, there are many more details that affect what you can do and what happens to you. But you see what I’m getting at. In other dungeon crawlers you storm in and roll dice, watch your position on the board and take care of your mana and health pool. In Perdition’s Mouth you have to take care of your card hand, of your position on the Rock of Destiny and on the board, you have to coordinate with the other players to survive. Many aspects of the game are like a cooperative eurogame, only that you also get the joy of killing monsters. Or being killed by them, because especially on the lower levels of the dungeon Perdition’s Mouth is hard. Other games let you heal completely between levels and let your heroes improve by leveling up. Here, you get your hit points restored, but the unpleasant wound cards stay in your deck. You also don’t level up, your character only improves through treasures he picks up along the way. If you don’t play carefully in the first levels you will walk into the Demon’s lair on your gums and get slaughtered. That goes well with the overall grit and darkness of the game, it not only includes terrifying insect monsters but also miniatures of helpless civilians being tortured on the wheel – and rescuing them is an optional goal, you can decide to leave them there and run. The rules for Perdition’s Mouth are finalized, polished and ready for the Kickstarter campaign in a few days. The scenarios are undergoing final editing, some are still a bit too easy to really make you sweat. After playtesting for a bit, we requested that the introduction scenario be made more punishing. Sorry for that, hehe. When that editing is done you’ll be in for a treat, there will be at least six dungeon boards, each with two or more possible scenarios to play on that level, and all of them will try to kill you. If you’re either into dungeon crawlers and curious about more euro mechanics, or you would like to be into dungeon crawlers but are scared of the dice, then Perdition’s Mouth is a project you should watch.